Temperature difference within a concrete structure may be caused by portions of the structure losing heat of hydration at different rates or by the weather conditions cooling or heating one portion of the structure to a different degree or at a different rate than another portion of the structure. These temperature differences result in differential volume change, leading to cracks. This is normally associated with mass concrete including large and thicker sections (³ 500mm) of column, piers, beams, footings and slabs. Temperature differential due to changes in the ambient temperature can affect any structure. The temperature gradient may be caused by either the centre of the concrete heating up more than the outside due to the liberation of heat during cement hydration or more rapid cooling of the exterior relative to the interior. Both cases result in tensile stresses on the exterior and, if the tensile strength is exceeded, cracking will occur. The tensile stresses are proportional to the temperature differential, the coefficient of thermal expansion, the effective modulus of elasticity (which is reduced by creep), and the degree of restraint. The more massive is the structure, the greater is the potential for temperature differential and restraint. Hardened concrete has a coefficient of thermal expansion that may range from 4 to 9×10-6 per deg. F. When one portion of a structure is subjected to a temperature induced volume change, the potential for thermally induced cracking exists. Special consideration should be given to the design of structures in which some portions are exposed to temperature changes, while other portions of the structure are either partially or completely protected. A drop in temperature may result in cracking in the exposed element, while increases in temperature may cause cracking in the protected portion of the structure. Delaying the onset of cooling. Controlling the rate at which the concrete cools by insulating the exposed concrete surface during first 5 days. This could be done by 50mm thick thermocol sheets encased with polythene sheet laid over concrete surfaces already covered with hessian cloth and water sprinkler keeping the hessian wet. The temperature gradient between core of concrete and the surfaces should not be allowed to be more than 150 C.
Increasing the tensile strength of concrete. Reducing the concrete temperature at placement up to say 32 0 C.
Using low heat of hydration cement or using fly ash replacement of part of cement. Keeping steel formwork warm by air heating during winter. Use of thermally insulating material as formwork. Keeping insulating formwork for longer duration. Low grade of cement, OPC 33 grade is the best. Cement with high C2S content. 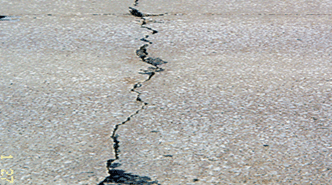 Repairs: Sealing and grouting of concrete cracks.